US: Sharia supremacist running for governor of Michigan screams ‘waycsim’ / Islamofauxbia against opponent for questioning about sharia law……. – The Tundra Tabloids……. US: Sharia supremacist running for governor of Michigan screams ‘waycsim’ / Islamofauxbia against opponent for questioning about sharia law……. Some of my supporters have said they have never voted for a liberal, but would vote for me because they value authenticity and a focus on people and their well-being. That is what matters to them as Michiganders. EAST LANSING — What started out as a relatively civil and calm debate of the seven Republican and Democratic candidates for governor Thursday ended with a bitter exchange on sharia law and connections to terrorism. 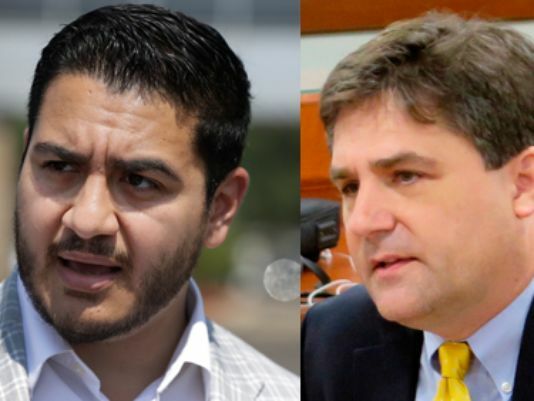 Sen. Patrick Colbeck, a Canton Republican, repeated his unfounded claim that Democrat Abdul El-Sayed has connections to the Muslim Brotherhood, who he claims are focused on a “civilization jihad,” of the United States. “I have very deep concerns,” said Colbeck. “Abdul El-Sayed, has a handful of affiliations with Muslim Brotherhood,” including his membership in the University of Michigan Muslim Student Association. “Every devout Muslim is an “Islamist”. Islam is not a personal religion. It is a religion of the public space. A “moderate” Muslim would have to reject Islam as a religion of the public space, as theocracy, and that secularism would be a rejection of Islam. Previous Post Previous Post Netherlands: anti-Islam Pegida plans to roast pigs in front of Islamic beachheads (mosques) during Ramadamadingdongdoo…….